Following their fantastic debut in 2008, New Jersey punk five-piece Titus Andronicus have been on an endless cycle of touring. Now, the band have settled down enough to prepare a second full-length. However, in place of their snarling, thinking man's frustration rock, the band will be exploring the American Civil War on their next album.. 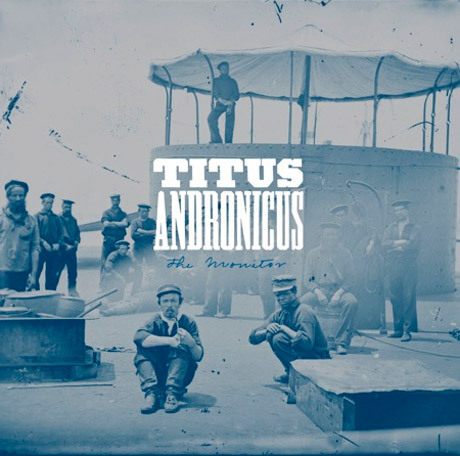 The album is called The Monitor, and features ten tracks based upon the divisive American battles. "It doesn't take place in olden times, nor does it necessarily feature any characters that participated in that conflict," front-man Patrick Stickles said in a statement. "Really, it is a record about how the conflicts that led our nation into that great calamity remain unresolved, and the effect that this ongoing division has on our personal relationships and our behavior and how they're all out to get us (or maybe not?) and yadda yadda yadda." The album features a number of guests, including members of Ponytail, Wye Oak, Double Dagger and others. Speaking with Pitchfork, the band's publicist revealed that the album will include spoken word interviews featuring the Hold Steady's Craig Finn appearing as Walt Whitman and Vivian Girls' Cassie Ramone playing Jefferson Davis. XL Recordings will release The Monitor on March 9. Before that, look for a seven-inch featuring the track "Four Score and Seven" on February 9. 1. "A More Perfect Union"
3. "No Future Part Three: Escape From No Future"
5. "A Pot in Which to Piss"
6. "Four Score and Seven"
8. "To Old Friends and New"
10. "The Battle of Hampton Roads"